This recipe came from allears.net‘s website. They have a ton of recipes listed from the WDW parks and hotels, as well as other events. This recipe can be enjoyed at Chef Mickey’s at the Contemporary Resort. This simple recipe is unbelievable tasty! My favorite breakfast food of all time, hands down, is french toast. Growing up, I used to just dip white bread into a bowl of eggs and milk. 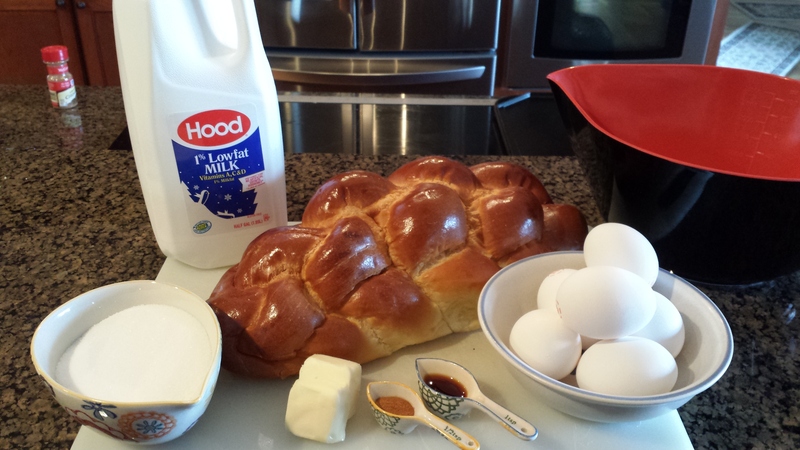 Then I was introduced to the wonder of challah bread, and it transformed my love of french toast into a near obsession. 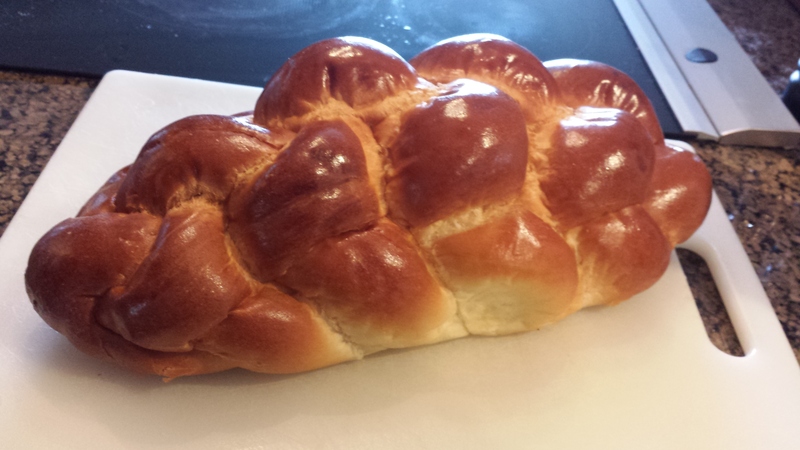 If you haven’t ever tried challah bread, I highly suggest making this recipe. But be prepared, you will want to make this delicious “Sunday breakfast” every day of the week! One of my passions is cooking, so combining that along with my love of Disney, making these meals and sharing them with you all makes me very happy! I will admit, as an amateur cook, I am always looking to tweak recipes a tad. This recipe stayed the same, but I would suggest making a tasty fruit “jam” to go along with the french toast. It’s simple, and I will include my favorite accompaniment below, along with the original recipe. To begin, gather all your ingredients. In a large mixing bowl, combine the sugar, eggs, vanilla, cinnamon, and milk.Whisk thoroughly and set aside. 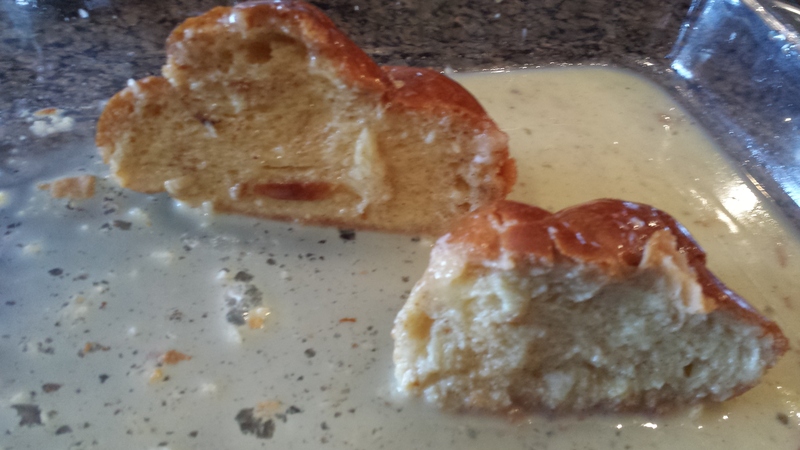 Now, pour the wet mixture over the bread. Reserve about 1/3 of the mixture. To make sure that the bread is evenly coated, I pour some mixture into the bottom of the pan before I place the sliced bread inside. Then, I drizzle most of the remaining mixture over the top of the bread, making sure to separate the pieces and get the liquid between them. I let the bread sit like that while I heat up the griddle. Once the griddle in warm enough to begin melting the butter, I turn the bread over and add the reserved mixture to any missed spots. Let the bread sit until the griddle is very warm. Crispy, golden brown on the outside. Warm and soft on the inside. 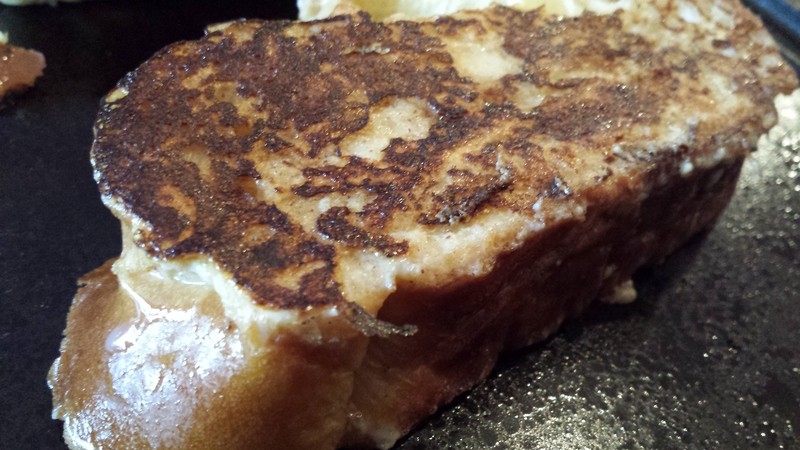 You want the griddle to be pretty hot so that the french toast develops the crust on the outside. Once you place the toast down, leave it alone. You’ll know when it’s ready to flip when the bread lifts easily with a spatula. It could take 5-7 minutes per side. Remember, the second side tends to cook faster! As the warm bread comes off of the griddle, place the cooked french toast onto a wire rack with a baking sheet underneath. You don’t want to put the hot bread onto a plate, because the heat will cause the bottom to get soggy, and eliminate that yummy, buttery crust you worked so hard to develop! It would be a breakfast tragedy. 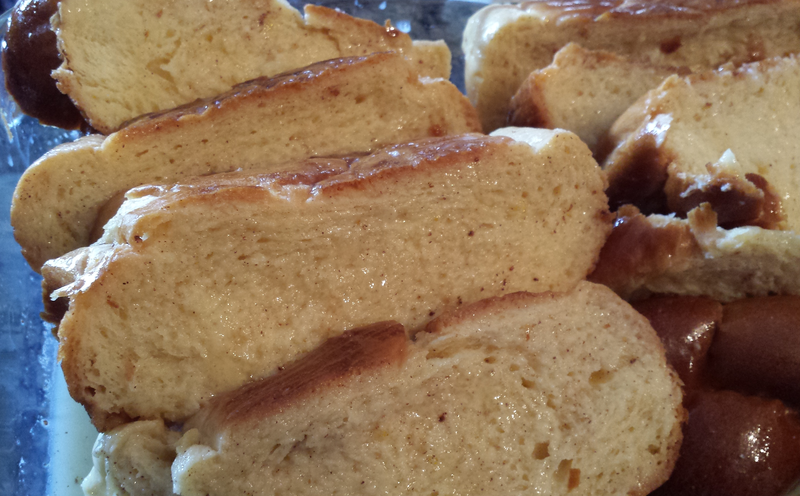 Behold, the French Toast masterpiece! All you need to do now is sprinkle some powdered sugar over the top and enjoy! But this Diva doesn’t stop there. You could warm up some maple syrup, but I really like to enjoy my French Toast with some macerated berries. It’s unbelievably simple, but it adds an elegant and special touch to this breakfast. All you need to do is choose which berry you would like to serve. I usually go with raspberries, but strawberries or blackberries work well too. Clean the fruit, slice them up so that they are chunky, and add them to a bowl with sugar. The typical rule of thumb is two tablespoons of sugar per pound of berries, but the important thing is to make sure the berries are evenly coated in the sugar. I mix this up before I even begin the french toast, because you want to set aside the berries for at least 30 minutes. The sugar draws out the liquid in the fruit, and makes a simple sauce while softening the berries. Once the french toast is done, the berries should be ready to mash. You can use the back of a fork to mash the berries, leaving some pieces so that the consistency is a bit thicker then a jam. 1. Gather all ingredients (mise en place). 2. Crack eggs into medium size bowl, add milk & vanilla. Wisk together with a fork or wire whip. Add the sugar and cinnamon mix all ingredients are incorporated. Set aside. 3. 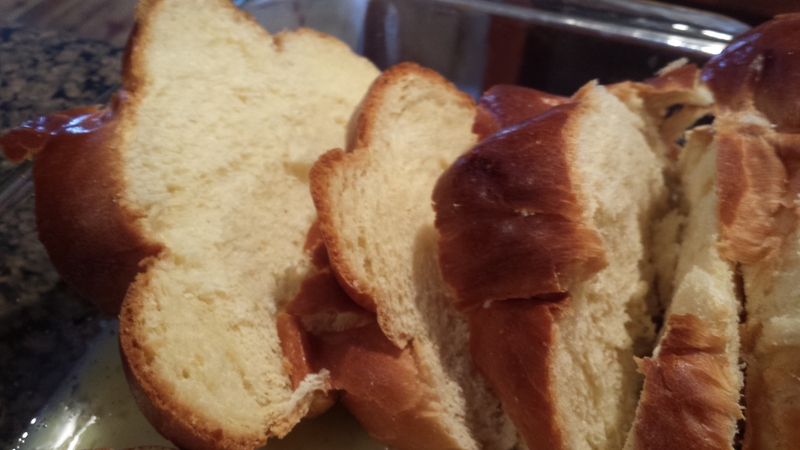 Slice challah bread into 1″ slices. Set aside. 4. Pre-heat flat grill or frying pan on medium heat (Teflon coated works best). Cover bottom of pan / grill with butter. 5. Dip bread into the egg mixture, place in pan/grill cook under golden brown on each side. 6. 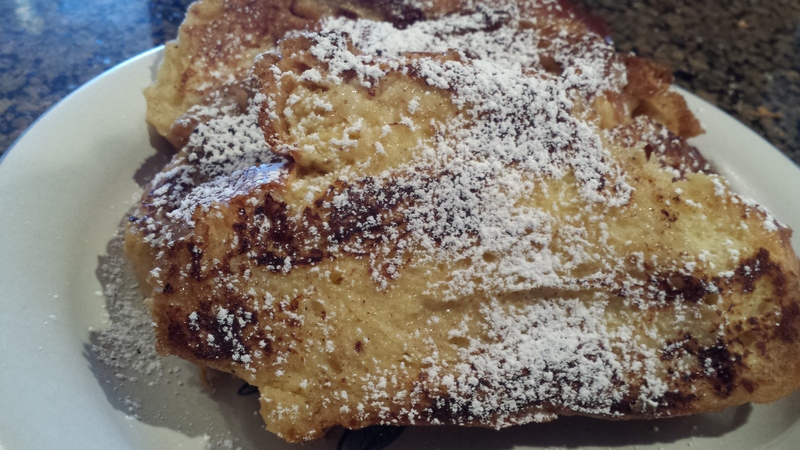 Remove from heat, plate up French toast and dust with the confectioners sugar.